A relatively large boat, like this 26' powercat, can be a bit tough to get moving on bunks. The owner of this rig took care of the problem by spraying the bunks with Liquid Rollers. 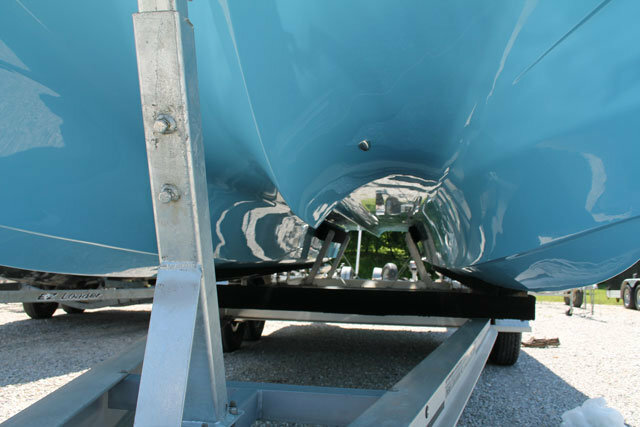 – Rollers make it easier to slide the hull onto and off of a trailer. If you have a very heavy boat or regularly launch at ramps with very slight inclines, they will make your loading and unloading a lot easier. However, they can also make it too easy. More than one boat has rolled freely into the water—or onto a concrete boat ramp—because the bow was released too early, and the boat slid a bit too easily. – Bunk slipperiness can be “adjusted” to fit your needs. Spraying bunks down with Liquid Rollers (made by MaryKate), or adding plastic “slick-strips” to your bunks, will make the boat slide a lot more easily than it does with carpet. Beware, however, of making them too slippery (for the same reason mentioned above). – Boats that sit for long periods can deform a bit, where the weight rests. Slight divots and “hooks” in the hull may appear over time. While this issue isn’t exclusive to roller trailers, it does happen more often with rollers than it does with bunks (because bunks spread the weight load over a larger area). If your boat will live on its trailer, and may not be moved or used for extended periods, this is a factor to consider. – Rollers require more maintenance. They need to be lubed on occasion, and yes, they can break. That’s not to say that bunks are maintenance-free, but usually, the only thing you’ll need to do to them is replace the carpet every five or six years. – Rollers are more expensive than bunks. The bottom line? For small, light boats, the choice won’t make much of a difference and most folks opt for the lower price tag associated with bunks. But if you have a heavy boat and a bad back, rollers may make a lot of sense. A relatively large boat, like this 26′ powercat, can be a bit tough to get moving on bunks. The owner of this rig took care of the problem by spraying the bunks with Liquid Rollers.